The caracal is a handsome, medium-sized cat that is common throughout Africa but infrequently spotted. Caracals very closely resemble the shaggy lynx species found in Europe, largely due to the odd pointy ears that the two share. They are much leaner, due to the different weather conditions the two have to withstand, and their fur is a mere thin layer of red-brown which covers their whole body and protects their skin from the sun - compared to the cold that lynxes have to be able to withstand. Caracals are quite average sized, like servals, and reach weights of between 12 and 18kg (26 and 40lb) among males, while females are slightly smaller at 8 to 13 kg (18 to 29lb). The distribution of caracals within Africa is very wide. The whole of Southern Africa, excluding the Namib Desert and northern parts of KwaZulu-Natal, is full of them. The story remains the same the further north you go into Malawi, Zambia, Tanzania, Kenya and Ethiopia along with the treacherous Somalian mainland and coastline. Most of Sudan and Egypt are also full of them. In West Africa, they are absent in the rain forests and jungles of the Congo and stop short of distribution in southern Angola, but then continue on the outskirts of the Saharan Desert into scattered areas of Morocco and the Mediterranean coastline. Caracals are really some of the most common animals you can find in Africa, especially considering that they are carnivores. They are very widespread throughout most of Africa and even in most of the Middle East and India, with strong populations in these areas. The Kruger National Park certainly does not have a shortage of them, but they are rarely seen due to their solitary and shy personalities. Their population trend is unknown, but this is maybe due to the vast lands that have to be covered in order to complete a proper report. They live in low densities of near 0,5 individuals per square kilometer, very much like the serval. Caracals appear in a vast variety of habitats, but prefer drier or more arid bush areas, provided that there is enough cover for them to conceal themselves in during the daytime while also staying out of the heat of the sun. They are also found in grasslands and woodlands, but are generally less common here, where servals flourish. Caracals can take down prey abnormally large when taking into account their size, as they tackle mountain reedbuck or domesticated sheep on a regular basis. Dassies and small primates also fall under their everyday prey list. Jackals are also fearful of caracal. Caracals organize themselves in much the same way as their fellow smaller cat species, the serval, does. They are primarily solitary animals with the exception of mothers and their cubs, with few interactions between two of the same species for the majority of the year. 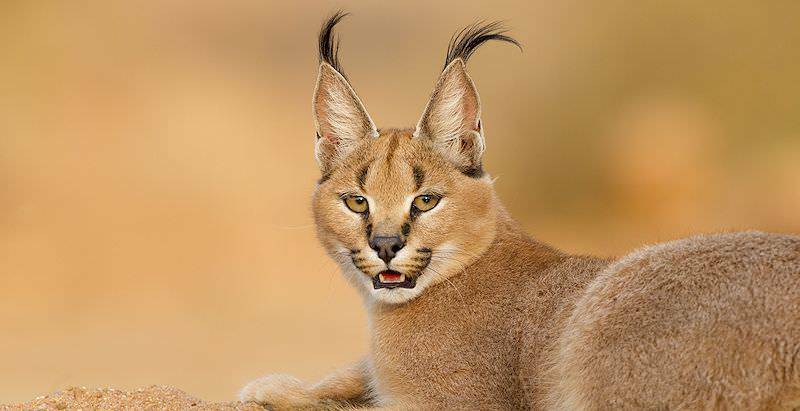 They occur in medium density with an example of this being the roughly one caracal found within every 261 hectare area of South Africa's Mountain Zebra National Park. They are not necessarily shy creatures, but usually blend in well with their surroundings, which make them considerably harder to spot. They are mainly active during the nighttime, like many cats, and make use of the excellent natural night vision that they share with other cat species to function well in the evening. They communicate visually, vocally and by using scent markers. Sounds they typically produce are similar to those of house cats and include meowing sounds or grunts and growls produced when agitated and defensive. They urinate on patches of flora, rocks or tree stumps as a form of olfactory communication or marking their territory. During the night, when they are at their most active, they can be seen hunting down prey much larger than themselves, stalking them and then finally delivering the killer blow to the back of the neck once they get their jaws close enough. Reproduction or mating between caracals occurs at the same general time every month, in sync with the birth peaks the species experiences during the summer months. It kicks off when females go into a period of heat for a few days, lasting up to a week. During this time, she may attract one of many suitors with whom she will inevitably mate. Copulation occurs in a few days within the middle of this period of estrus, and entails copulations of roughly 4 minutes. When the female does not conceive, this period may repeat some two weeks later. If she successfully bears a litter, they are usually born at the end of a 62 to 81 day period. Litter sizes vary from 1 to 4 kittens but are two on average. Caracals, being the predominant predator in most of the habitats that they live in, are not pestered by predation nearly as much as they pester other species. Their young, on the other hand, born to be only a few hundred grams in the early days of their lives, are very vulnerable. They are thoroughly protected and shielded from the outside world by their mothers when they are at their most vulnerable, but are especially endangered by the same predators who feed on other small mammals. Eagles, pythons and rival dog or cat species all pose a threat to kittens, including humans who are irritated by the presence of caracals in agricultural areas. Travel to South Africa with African Sky for an unforgettable vacation. Botswana is replete with sprawling wildlife-rich national parks. Namibia is one of continent's most underrated safari destinations. Zambia's top destinations include the Victoria Falls and South Luangwa. Mozambique is a tropical paradise of secluded beaches and islands. The Greater Kruger National Park is a sprawling wilderness area that supports an extraordinary diversity of wildlife. The Sabi Sand Private Game Reserve boasts a remarkably high frequency of leopard sightings, along with the rest of the Big Five. Tour Cape Town for a beguiling combination of historical intrigue, outdoor pursuits and cultural immersion. The Garden Route's exhilarating adventures include riding atop elephants and walking alongside cheetahs.